Ad-funded and BBC stations see reach drop among 15- to 24-year-olds. Landmark headline figures for commercial radio consumption in the latest set of Rajars are masking the medium’s problems with declining reach among the 15- to 24-year-old age group. The overall picture continues to be of commercial radio increasing its reach and share at the expense of the BBC, which lost 3% of its audience year on year. Commercial radio industry body Radiocentre pointed out that the sector has recorded its biggest share of listening since 2001 at 46.5%. Moreover, ad revenue figures also released today by Radiocentre show that brands spent a record amount on the medium in 2018, up 5.1% from 2017 to £713.3m last year. Siobhan Kenny, chief executive of Radiocentre, said: "Confidence in the power of radio is continuing to grow among a wide range of sectors, including those that have previously been reluctant to use a non-visual channel such as clothing and cosmetics." Flagship commercial stations had a good quarter, with the reach of Global’s market-leading Heart brand climbing 6.2% year on year to 9.74 million weekly listeners, Bauer’s Magic network rising 8.3% to 4.22 million and Global's Smooth brand adding 7% to 5.83 million. BBC Radio 2, in contrast, shed 3.9% of its audience, dropping to 14.89 million. However, the more youth-oriented brands struggled to hold their audience. The total number of listeners to Bauer’s Absolute Radio fell 8.5% year on year to 2.39 million and Global’s Capital brand dipped 0.5% to 8.25 million. The notable exception was Capital Xtra, which attracted 14.9% more listeners to reach 1.79 million. Yet, despite the BBC’s Radio 1, 6 Music and 1Xtra all losing listeners over 12 months, Bauer’s Kiss was unable to benefit, seeing its audience climb just 0.1% year on year to 5.57 million. Rajar’s demographic breakdown shows that, while commercial radio’s reach has held steady in the 25-44 age group over the past three years, both commercial radio and the BBC have been struggling to keep the interest of the 15-24 age group over the same period. The BBC was reaching 56% of the age group in the fourth quarter of 2015, but this stood at just 50% in the final quarter of last year. Commercial radio was reaching 73% of them in the fourth quarter of 2015, falling to 67% in the fourth quarter of 2017 and recovering slightly to 68% in the last quarter of 2018. However, Ruth Cartwright, head of audiovisual at Amplifi, explained that younger listeners are still interested in radio, but are consuming it in other ways. "Technology may be enabling 15- to 24-year-olds to stream music and listen to podcasts, but radio ‘brands’ remain a key part of their experience," she said. "What’s more, the arrival of 5G across a number of providers this year is only likely to increase their engagement with the medium. Radio is still relevant to a younger audience, regardless of which platform they are accessing it on – the medium’s real challenge, whether commercial or the BBC, is to continue to deliver content that appeals to 15- to 24-year-olds, fronted by relevant and knowledgeable presenters." Among the commercial stations whose performance stood out this quarter was LBC, which poached Eddie Mair from the BBC last summer, and Classic FM, which is facing future competition from Bauer’s soon-to-launch Scala Radio. 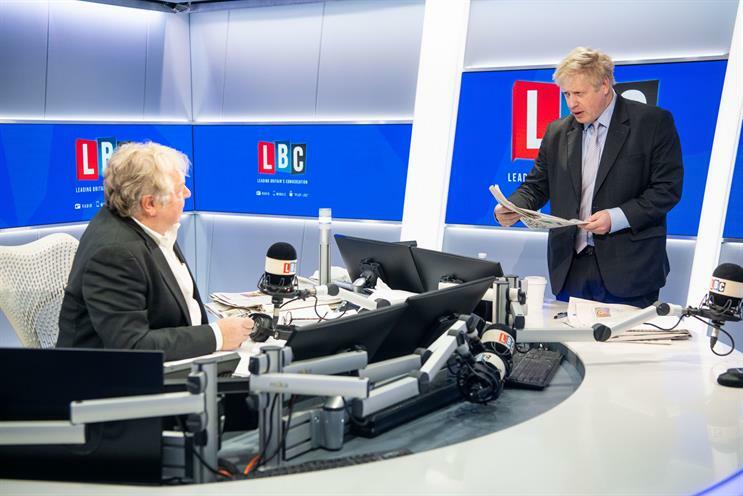 The LBC network, owned by Global, reported a record audience of 2.21 million listeners, up 9.3% year on year, with breakfast host Nick Ferrari achieving his highest reach to date. However, Classic FM (also part of Global) lost 6.4% of its audience year on year, leaving it at 5.31 million.